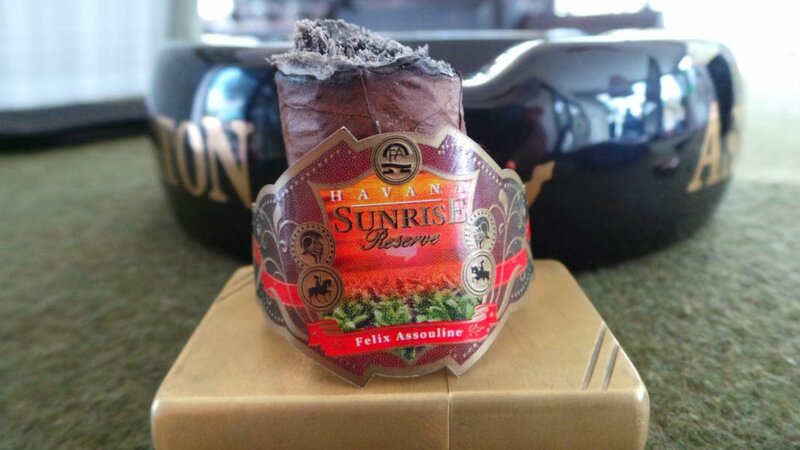 Home » Cigar Reviews » Cigar Review: Havana Sunrise Reserve "Brilliance"
I recently reviewed a cigar called “Ringo” from Felix Assouline Cigars, a new company that I encountered at IPCPR. Today, I’m smoking the second of two samples they provided of another Felix Assouline offering, the Havana Sunrise Reserve (HSR), in their “Brilliance” vitola. 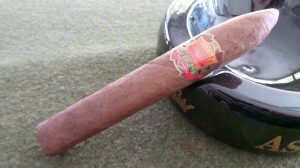 The HSR is a reblended version of Benny Gomez’s previously available cigar bearing the same name. From the Felix Assouline website: “Havana Sunrise Reserve is our nod to the old traditions of yesterday…..[It] is a medium to full body line introduced in 5 vitolas.” The five vitolas are: Beacon (56X6.5″ Toro), Brilliance (54X6.5 Torpedo), Blaze (54X6″), Prelude (52X4.75″), and Ray (44X5.5″). 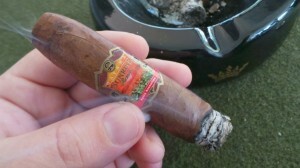 The Havana Sunrise sports a Habano ’98 wrapper (of unspecified origin), Indonesian binder, and a filler blend of Nicaraguan and Honduran tobacco – this same basic theme runs through all four introductory blends offered by Felix Assouline, with adjustments to filler composition to achive differing flavor profiles. All vitolas come in boxes of 30 box pressed cigars.” MSRP for the Brilliance is $7. Both cigars smoked for today’s review were a fairly evenly colored medium brown, with sparse spotting/mottling and an oily feel and appearance. The seams and veins are modest in appearance, and construction has been exceptional. I found no hard/soft spots within the pack, and the draw has been free but deliberate. The cold draw on both provided a mild hay flavor, and while unlit they gave a very subtle but sweet tobacco barn aroma. The HSR lit exceedingly well, and very easily. I am normally a much smaller ring-gauge smoker, but I have to admit the Brilliance was quite comfortable for me – presumably due to the elongated press and tapered head of the torpedo. An early spice in the opening minutes is a surprise for me. In my mind, I suppose I was expected something more akin to the original Havana Sunrise blend – which had very little spice. Today’s HSR is more in line with what we see coming from Nicaraguan manufacturers in recent years. The flavors themselves for this early portion are a bit leathery, and the spice really only presents if you give the smoke a quick retrohale. As I progressed through the first two inches of each stick, I noticed that the tingle on retrohale began to taper, allowing the background flavors to become more pronounced and really shine through. In general, the profile at this point sweetens, but remains very much in the tanner’s corner. In the final stretch, I was greeted with an unexpected resurgence in the early spice. While never mild in flavor, this was a bold wakeup call, in terms of both flavor and strength. I might have placed the HSR firmly in the medium range previously, but at this point I would lean toward calling it full-strength overall. It isn’t the strongest powerhouse of a blend I’ve ever smoked, but you will not lose sight of the fact that you are smoking a cigar….yet it doesn’t punch you in the throat with an overbearing strength. It’s more of a “velvet hammer” approach. The strength did begin to sneak up on me toward the very end. 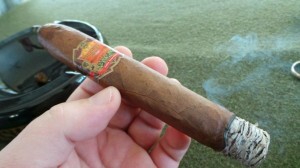 As for flavor, I would definitely classify the HSR as full bodied. There are some hints of coffee in the final half hour of smoking, accompanied by the earlier noted leathery, toasty character. I did experience some mild scalloping in the burn toward the end of both samples, but never anything worth more than a mention. A quick touchup with the lighter resolved all issues. I have to say I have thoroughly enjoyed the Havana Sunrise. It’s strange; I enjoyed Benny’s previous blend…and while the current incarnation of the HSR is radically different, I have enjoyed it greatly as well. In fact, I’m hoping one of my local Tampa shops picks up the line. It’s a blend I would love to have in my regular rotation. For those of you who enjoy and appreciate Nicaraguan spice accompanied by a blending style that showcases dark, sweet flavors to provide a beautiful backdrop for it, the Havana Sunrise Reserve comes highly recommended. I’m not sure if the Havana Sunrise Reserve just might be a little ”strong”, by your review. 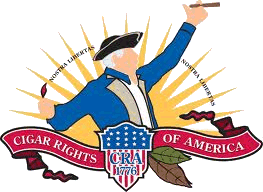 If I see this cigar, I will smoke it, and let you now how I did.